Growing up in rural Taranaki, Aaron developed an appreciation and passion for the environment. Surrounded by natural energy producers he also gained an enthusiasm for the energy industry, which sparked his interest in the Earth sciences. Aaron has been selected for Chevron Australia’s Horizons’ Programme, which will take five years and involve three different assignments. For Chevron he’ll be undertaking exploration, production management, research and development, and reservoir management and development. He’s one of three graduate geologists that Chevron’s taking on in 2014. Aaron will be the sixth Waikato student in as many years to be selected for a graduate position in Chevron. Following secondary school at Francis Douglas Memorial College in New Plymouth, he chose Waikato University due to the world-class facilities available for students and the exceptional teaching and research regime. He credits the numerous field trips as having been a highlight of his studies, with trips to Huriwai Valley to map stratigraphy and into the Taupo Volcanic Zone, including doing the Tongariro Crossing as part of a third-year Earth Sciences paper. “I wanted a more personalised, hands-on experience at university, and Waikato provided that." University of California Davis student Kathleen Martinez chose an exchange in New Zealand because of the unique ecosystems, beautiful landscapes and rich Maori heritage. Just half way through a 10 month exchange at the University of Waikato, Kathleen credits her exchange as the highlight of her university experience thus far and says she has already grown in so many ways. “I wanted a more personalised, hands-on experience at university, and Waikato provided that. Waikato puts an emphasis on small class sizes, and the science papers typically have a lab and field work component. I’m in a lab the same amount of time, if not more than I’m in lectures each week, which really helps me retain the information I’m learning,” says Kathleen. As an environmental sciences student, Kathleen found that the excellent variety of resource and ecology papers at Waikato made it easy to choose classes that would count towards her degree. She describes Hamilton’s location within the North Island of New Zealand as ideal for travelling. With its proximity to the ocean, the Coromandel region and more, Kathleen has been able to explore the area easily and has taken lots of small road trips during the semester. After graduation, Kathleen hopes to become an environmental scientist, natural resource scientist, or environmental consultant; and because of her time in New Zealand, she says she is now inspired to live and work abroad in the future. 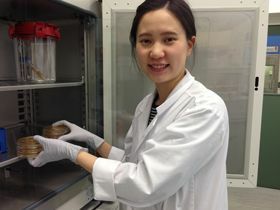 "As a Coastal Modeller my main duties include setting up numerical models to analyse relevant coastal processes..."
Maintaining healthy harbours and estuaries is just one of the projects that Waikato PhD graduate Cathy Liu has been involved in during her time at the Waikato Regional Council (WRC). "As a Coastal Modeller my main duties include setting up numerical models to analyse relevant coastal processes and provide data and information on Waikato's coastal environments. This includes developing models which can help the council to access changes, threats and impacts on the coastal and marine areas and make decisions about the management of these areas." One highlight for Cathy has been her work on the Whitianga Marina project. "A plan was introduced to change the current marina access channel direction by dredging. I developed a set of hydrodynamic and sediment transport models of the Whitianga Harbour which were used to estimate the impacts of the physical process on the channel, and also the impacts of channel dredging on the harbour's health." Cathy began working with the WRC in 2012 during her PhD research into Hydrodynamics and Sediment Transport in the Tairua Estuary. Her research involved substantial field data collection from waves, tidal currents, river flow and suspended sediment concentrations as the basis for establishing a fully calibrated and verified hydrodynamic and sediment transport numerical model of the Tairua Estuary on the East Coromandel Coast of New Zealand. The opportunity to spend plenty of time getting hands-on experience in laboratories and out in the field made Waikato University’s BSc the ideal choice for Ryan Lee. During his undergraduate degree, Ryan learnt about a range of Earth Sciences-related topics, including soils, volcanology, geology, engineering geology, environmental monitoring, geochemistry, geographic information systems and hydrology. The enthusiasm he developed for the subject drew him back for a Master of Science, which he has just begun. Within his masters he’s studying a variety of Earth science related papers as well as some chemistry and GIS papers. A former Thames High School, Ryan chose to study at Waikato because of the university’s great reputation and its close proximity to his home town. "The flexible BSc course structure and passionate lecturers have allowed for more one-on-one time with staff and more feedback on assignments. I believe I wouldn't be where I am today without that additional help." Smaller class sizes, enthusiastic lecturers and field trips to exciting North Island locations has made Earth Sciences study at Waikato a top experience for student Billy Bodger. Billy completed a BSc in Earth Sciences before beginning an MSc in 2013, with a focus on geology. "The flexible BSc course structure and passionate lecturers have allowed for more one-on-one time with staff and more feedback on assignments. I believe I wouldn't be where I am today without that additional help," says Billy. Some memorable field trips have included a six day excursion to the Hawke's Bay for a sedimentary geology paper and a trip to the GNS Science Wairakei Research Centre for a volcanic geochemistry paper. "Both of these field trips and all the other practical activities and applied research I have undertaken at Waikato have given me a valuable insight into the tasks that I could expect to encounter in industry. I have no doubt that these experiences will give me a head-start career-wise." A School of Science Masters Research Scholarship in late in 2013 helped kick-start Billy's masters study. Now undertaking research in volcanic geology and gold mineralisation, Billy has been fortunate to work with an international mining corporation and is now trained to use a range of Waikato's excellent laboratory facilities specific to his research. "Being able to tailor my degree to suit my strengths and interests makes Waikato a top choice for study. Once you come to Waikato, the doors will open for you and the opportunities are endless." “The BSc(Tech) is such a flexible and job-orientated degree that incorporates both management as well as science and technology." The interdisciplinary and systematic study of the earth’s natural resources, environmental systems and processes and natural hazards led Earth Sciences Graduate Tasman McKelvey’s to his role as an Environmental Monitoring Technician for Lincoln Agritech Ltd.
Tasman now works within the environmental group which specialises in research surrounding New Zealand's freshwater resources. “Currently, the group is focused on the Transfer Pathways Programme (TPP), which aims to quantify pathway-specific transfers of nitrogen (N) and phosphorus (P) within freshwater systems. As part of this, I am heavily involved with set-up and maintenance of environmental monitoring systems, management and flow of data, and data analysis – so that we can better understand, model, and ultimately manage our freshwater systems” says Tasman. Tasman, who attended both Tuakau College and Mount Maunganui College, completed a Bachelor of Science (Technology) majoring in Earth Science and loved the experience he gained from his practical hands on degree. Although Laura Hines says that University is not just about the learning, she did a lot of it while she was at the University of Waikato! Laura completed her Bachelor of Science and Master of Science (Research) qualifications doing double majors in both and gaining first class honours in her Masters. The connections Laura made with both students and lecturers were the highlight of her time at the University of Waikato. She is now working alongside some of the people she studied with and is sure that her networking during her study helped her to secure her current role. Laura is working at Tatua Cooperative Dairy Company as a Chemistry and Microbiology Laboratory Technician. She enjoys the variety her role offers – one day she will be elbow deep in chemistry and the next in microbiology. Laura has an important role where she tests milk powders and food products to make sure they are within specification and are the highest quality before being released to the customer. Tatua have given Laura the opportunity to carry out a work based project to determine if improvements can be made on current processes and procedures for thermophile and aerobic plate count tests. Laura believes that “life is all about your attitude”. To succeed, she believes that students need to work hard, study hard, have goals and never be afraid to ask questions. “I really enjoy building relationships and trust with the animals and exciting people about animals." Hanging out with Rhino’s is just a standard day in the office for Bachelor of Science (Technology) graduate Anthony Coventry. Anthony, a previous Otorohanga College Student, completed his BSc(Tech) in Biology and Earth Sciences at Waikato and now works as a Zoo Keeper at Hamilton Zoo. “I really enjoy building relationships and trust with the animals and exciting people about animals - inspiring them to look into what they can do to help both local and international conservation groups” says Anthony. Anthony’s study enabled him to meet a number of people in a range of different industries through his work placements – which ultimately lead him to getting his dream job at Hamilton Zoo. “I really liked how the BSc(Tech) degree allowed me to have real work experience and connected me with people in the working world from a variety of industries”.